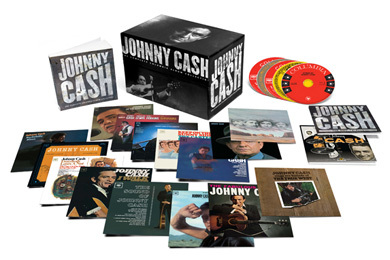 Just in time for holiday shopping, Sony Music will release Johnny Cash — The Complete Columbia Album Collection, a deluxe box set featuring 59 of Cash’s albums on 63 CDs. The set will be available October 30 through Columbia/Legacy. Beginning with 1958’s The Fabulous Johnny Cash, and running through 1990’s Highwayman 2 (with Waylon, Willie, and Kristofferson), the set includes 35 albums being released on CD for the first time and the artist’s first 19 albums presented for the first time in mono. The collection will come in a special box, with lift off cover and a full-color booklet with complete discographic information for every album. Rich Kienzle provided the liner notes. To compliment the Columbia releases, two new compilations have been assembled for this set. Johnny Cash With His Hot & Blue Guitar is a 28-song collection of single and non-single tracks released during his Sun Records years (1954-1958) including “Hey Porter,” “I Walk The Line,” and more. The Singles is a 2-CD, 55 song collection of single sides that did not originally appear on Cash’s Columbia albums, plus his guest performances on other artists’ albums. Also included are rare albums like Johnny Cash pa Osteraker, a 1972 live album from Sweden’s Osteraker prison, and the motion picture soundtrack for the Gregory Peck-starring I Walk The Line. More info, including the complete album disc listing, here. Amazon has the set available for pre-order with a $269 price tag.